Last month, during my blogger weekend in Port Elizabeth, I visited the SA Marine Rehabilitation and Education Centre (SAMREC) in Cape Recife. 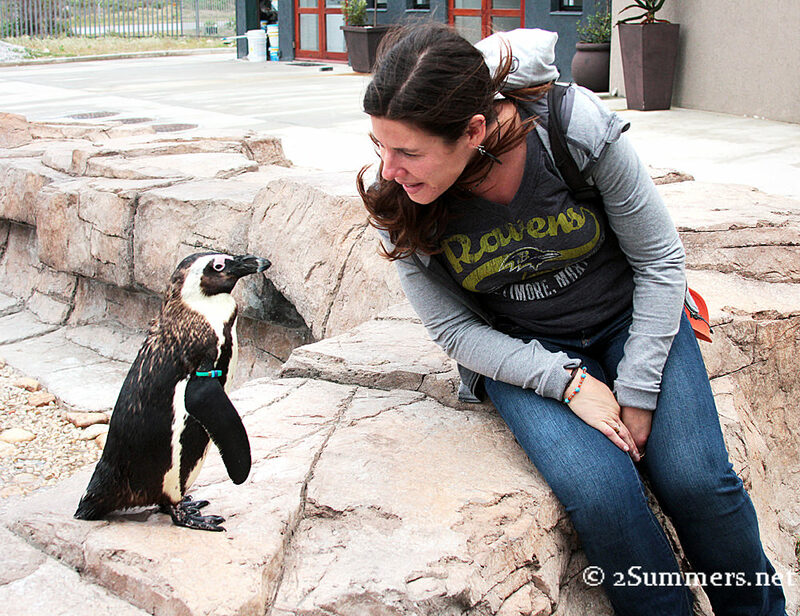 SAMREC, a small, volunteer-run non-profit, rehabilitates sick and injured African penguins and other marine wildlife. It’s also an education centre with fun exhibits and games relating to marine animals. An eerily life-like stuffed penguin in the SAMREC education centre. 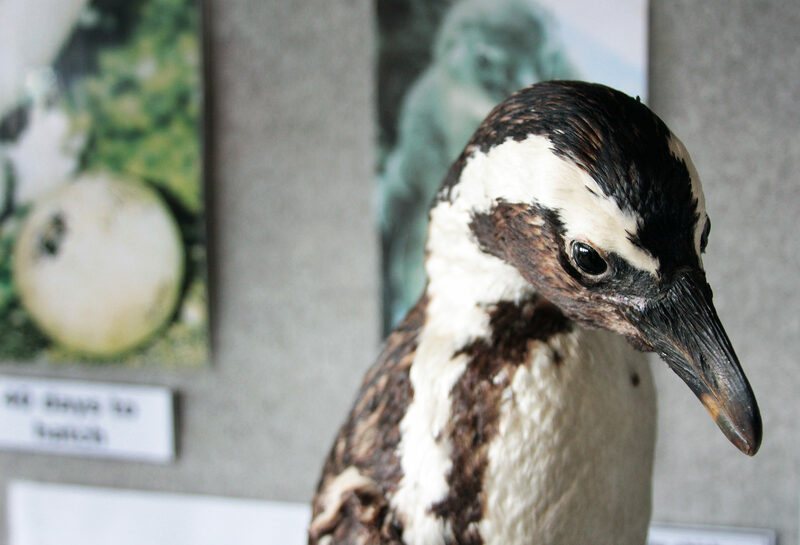 When penguins come to SAMREC and…don’t make it, SAMREC Director Libby Sharwood takes them to her taxidermist. 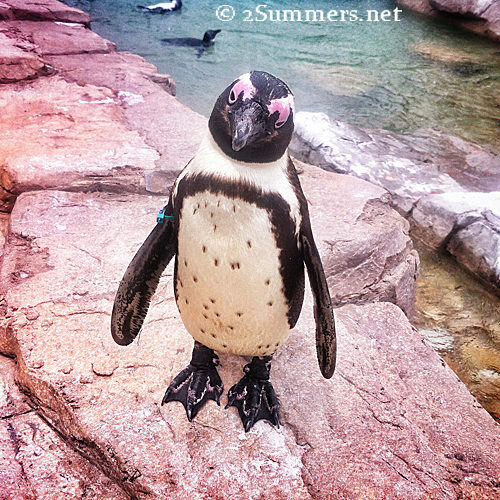 Before visiting SAMREC I had no idea how highly threatened African penguins are as a species. 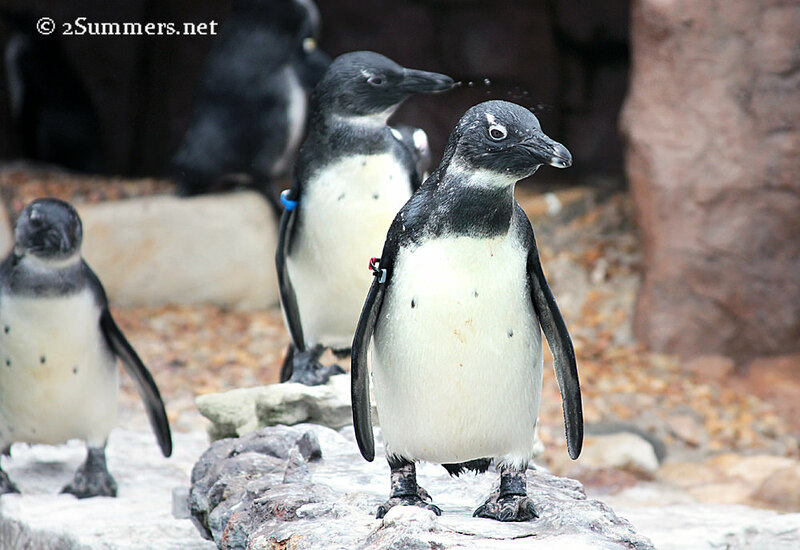 St. Croix Island, which is close to Port Elizabeth in Nelson Mandela Bay, had about 50,000 breeding pairs of penguins in 2000. Today, that number is down to 6625 breeding pairs. 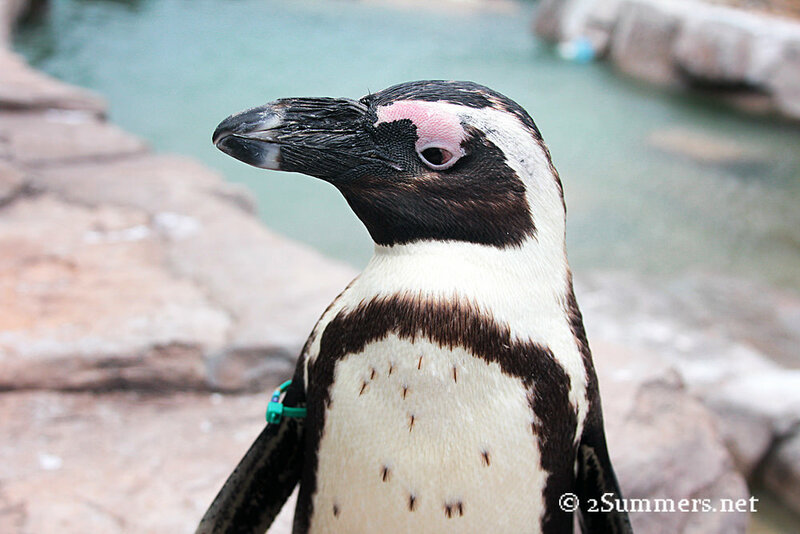 There are only 21,000 breeding pairs of African penguins left in the world; the decline is likely due to a combination of factors, including global warming, overfishing, and pollution. 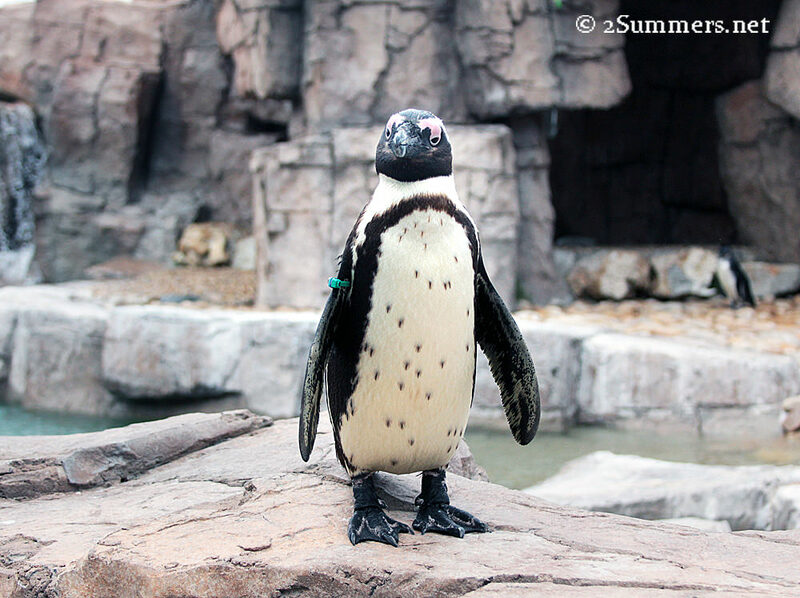 Most of the work that SAMREC does involves rescuing malnourished young penguins who wash up onto the shore, fattening them up getting them healthy, and then releasing them back into the wild. Upon arrival at the centre — on a blustery, rainy Saturday morning — my group met Libby Sharwood, the formidable retired teacher who founded SAMREC. Libby took us into the education centre and showed us around, giving us some background on the history of SAMREC and the challenges faced by African penguins and other local marine wildlife. I had a hard time listening though. All I could think about was seeing the penguins. Finally we went to the clinic in the back, where the rescued penguins are fed and cared for. The world is filled with sad things. But for me, I’m not sure there is anything on earth more heart-wrenching than the sight of a sick penguin. 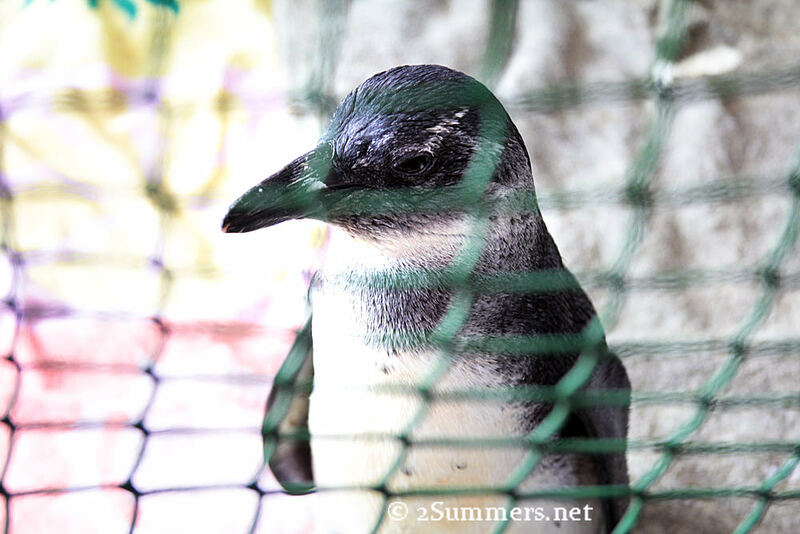 One of two sick penguins who were being cared for in the clinic while we were there. The moment I saw the two little penguins, waddling around in their small pen, my eyes filled with tears. I could barely stand it. If you’re looking at this photo and do not have at least a couple of tears in your eyes, I think there might be something wrong with you. 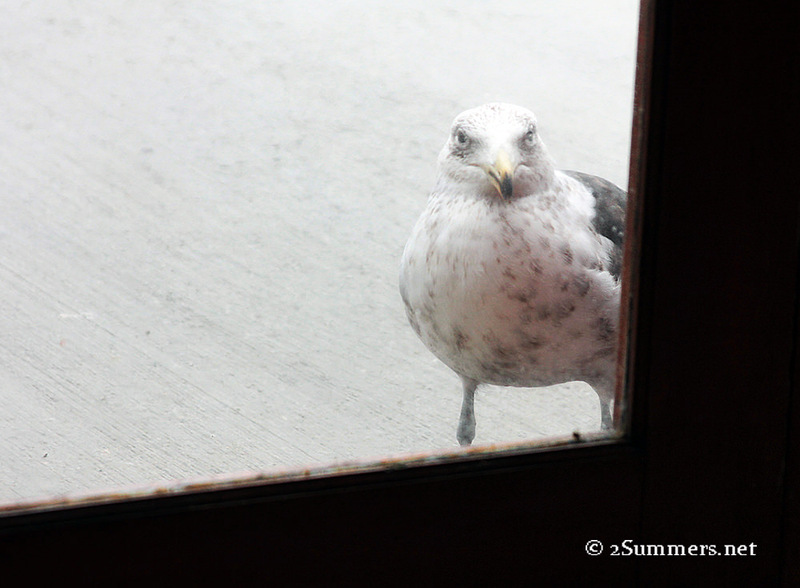 I’ve forgotten the name of this seagull. But he was rehabilitated at SAMREC and now comes back frequently to visit. So cute. Fortunately I didn’t have to feel sad for too long. After visiting with the sick penguins inside, we went outside to see the rehabilitated penguins who are being prepared for release. There were a dozen or so penguins splashing around in the outdoor area. Penguins getting ready to jump into the water. 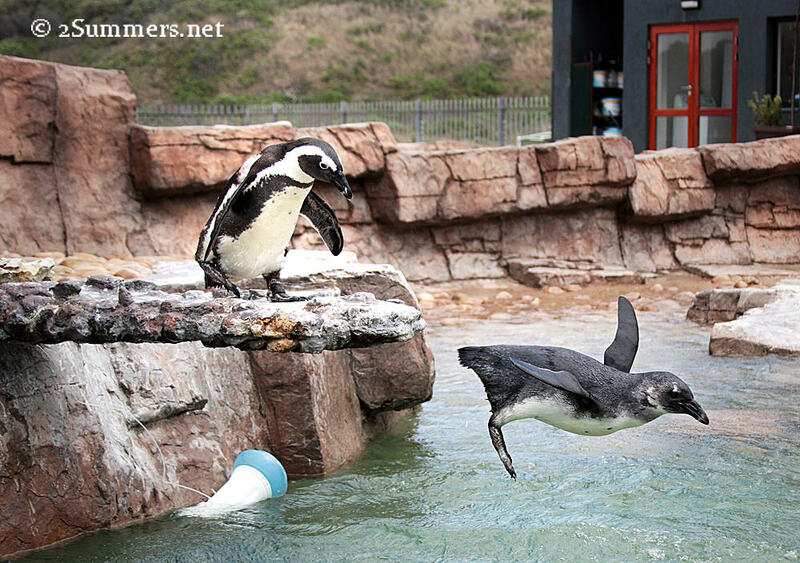 The penguins like to line up on the penguin diving board and dive in one at a time. 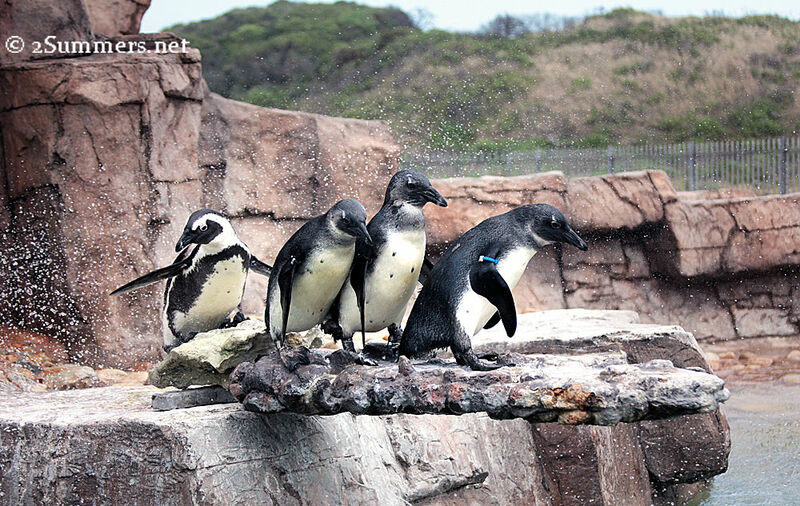 I managed to get one decent action shot before the penguin-diving conga line was finished. I could have stayed out there all day. Libby sat down on the wall at the edge of the pool. Soon a lone penguin, named Agro, joined her. This is Agro. He’s not like the other penguins. Hanging out with Agro was pretty cool. There’s a reason why I waited until today to write this post. It’s same reason (in addition to the sad plight of these charming, beautiful animals) why I cried so much when I was at SAMREC. In 2000 there was a huge oil spill off the coast of South Africa’s Western Cape, and thousands of penguins were covered in oil. Jon, who was then a freelance photographer for the International Fund for Animal Welfare, spent three months documenting the rehabilitation of those penguins and it was one of the most meaningful assignments of his life. He won a World Press Photo Award for his work. 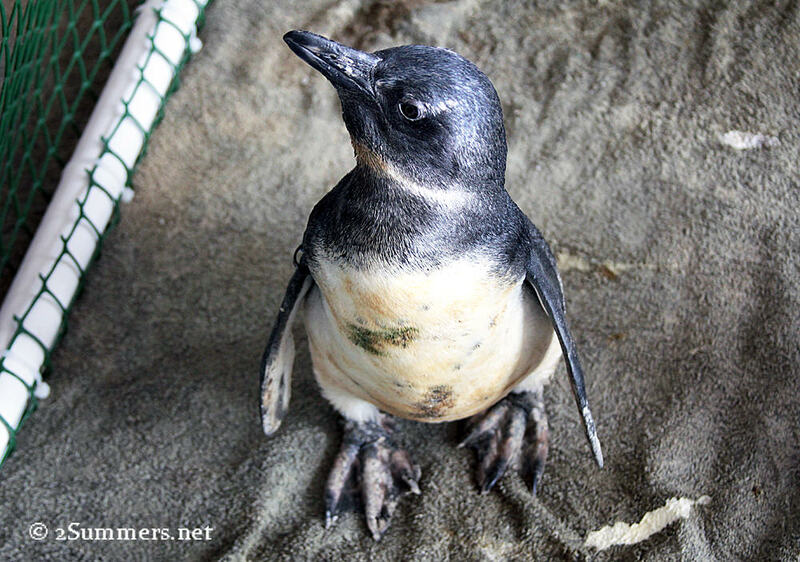 Here are some of Jon’s photos from the penguin rescue. As I sat watching Agro at SAMREC last month, I decided to dedicate this post to Jon, who died two years ago today. An Agro Instagram. Agro, I’m sorry that Jon didn’t get to meet you. SAMREC is struggling to stay afloat financially, and trying to raise money for solar panels so the centre can go off the grid. (Electricity is one of the centre’s biggest financial drains.) If you’d like to donate, visit www.samrec.org.za. Oh my gosh the diving penguin is just gorgeous!!! Thanks Rachel, I’m glad you like the post. Hope you’re doing well and have a great holiday. What a sweet post Heather! I’m sure Jon would have appreciated it. Thanks Meruschka, I know he would have. Great pics, great writing, really liked it. Oh my gosh, I love the penguins! And that action shot is amazing. Hope to visit this place one day soon. Before reading your post I thought all penquins were the ones in the South Pole. So, I am learned something new today, Thanks and thanks for the close-ups. I really enjoyed reading about this blogger’s visit to a origanization devoted to the care of endangered and ill animals. I think you may like it too. Oh I so love the picture of the diving penguin! Will now go over to the link for Jon’s photos. I can’t believe it’s already been two years. That in itself brings tears to my eyes. Time passes too fast! wow, just looked at pictures and his “penguins return to the ocean” is phenomenal! Yes, those shots are all great. Indeed it does. Hard to believe for me too. Thanks Jonker. And thanks again for taking us there.